There’s something so absurdly ambitious about Zombie Joe’s Underground production of “King Lear” - you really want it to work. If you’ve never been to Zombie Joe’s it’s tiny shoebox of a theatre in the Valley. The rectangle of a stage is maybe 12 by 24 feet. The walls solid black. From the ceiling a handful of clip lights are the only thing illuminating the action. There’s no set to speak of just a black box that’s maybe the size of a tipped over refrigerator. This is down and dirty theatre. As if squeezing “Lear” into the space wasn’t enough, they’ve also decided to do Shakespeare’s five-act epic as basically a 90 minute one act. Like I said, absurdly ambitious. Now, there’s something thrilling about seeing theatre in this tight a space. There’s an energy that’s undeniable. You’re never more than a couple feet away from the actors, even if you’re in the back row. An actor yells or brandishes a sword and there’s palpable danger. The trouble is that energy, and Shakespeare’s language, gets the better of the cast. It feels a bit like iambic pentameter that’s being shot out of a firehose. While the actors seem to know what they’re saying there’s hardly a moment for anything to actually breathe. The result feels like a strung together set of end states rather than actions. The characters feel more like ideas fueled by one too many Red Bulls. Their portrayals announce themselves like the seven dwarfs of rushed acting: I’m evil, I’m overly ambitious, I’m wacky, I’m mad: the souls and complexities of Shakespeare’s characters reduced down to their simplest function. The whole thing would be a noble, if dismissible, mess if it weren’t for Robert Prior’s Lear who is unlike any Lear you’ve seen before. For starters, this Lear has a sharp edge to him. You get why a retinue of 100 knights to accompany this aging King might be a bit much for any castle. This is not frail retirement. And once Lear recognizes the error of his faith in his two eldest daughters, Shakespeare’s insults find a happy home in Mr. Prior’s delivery. When says of his eldest, “Thou art a boil, A plague-sore an embossèd carbuncle,In my corrupted blood.” You get it - I confess, I’d never really heard how brutal Lear can be. While Lear’s journey through the storm gets blown away too quickly by the over-the-top wind sound effects, his later struggles with sanity are deeply touching. While the actors around Lear take madness (or any other state) as an excuse for over-indulgence, Mr. Prior’s madness is more nuanced. When he says ‘I fear I am not in my perfect mind’ - you believe him and … pity him. Unfortunately, the production that surrounds him doesn’t support more than a second of reflection or any of the nuance that Mr. Prior is bringing to this dispossessed King. I’m happy that there are still tiny rooms in LA where actors can give something this ambitious a go. That said, this isn’t a production you need to run out to see. 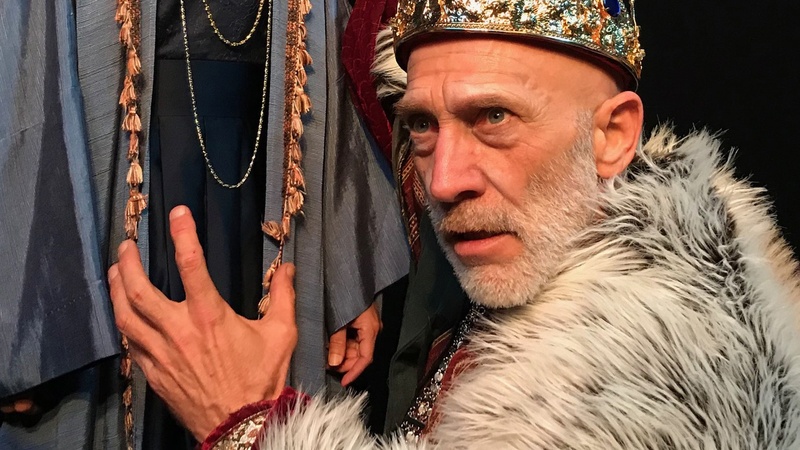 “King Lear” plays at Zombie Joe’s Underground in the Valley through December 17th.